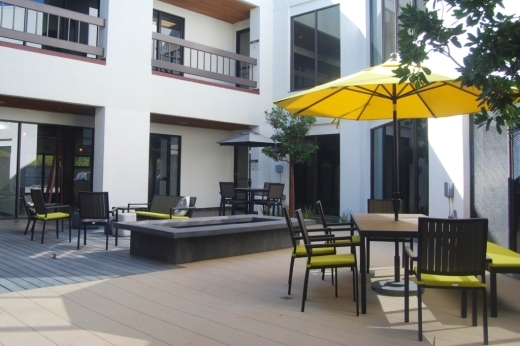 This summer California Lutheran University will open a Westlake Village center to house a new business incubator and provide expanded facilities for its Community Counseling Center and School of Management. At the core of the nearly 18,000-square-foot facility will be a business incubator and coworking space for CLU students and the public. The space is the next step in CLU’s effort to expand entrepreneurship opportunities. CLU’s graduate programs in entrepreneurship and economics and the Center for Economic Research and Forecasting will be relocated from the main campus in Thousand Oaks to the new center. Four classrooms and five offices will wrap around the coworking and incubation area to encourage interaction. As a coworking space, it will be designed to promote openness and collaboration. There will be a variety of areas for individual and collaborative work including a coffee bar and patios with fire pits. CLU’s Community Counseling Center and Parent-Child Center will also move from the main campus to the new building. A state-of-the-art training facility for students earning graduate degrees in psychology is being designed. Unlike the current center, the new clinic will have one-way mirrors for student supervision and technology enabling classrooms to pick up live audio feeds from mediation sessions. The new space will also provide additional therapy rooms and more parking for staff, students and clients. The Community Counseling Center opened 30 years ago in Thousand Oaks and launched a second center in Oxnard several years ago. The centers provide low-cost counseling and psychotherapy for families, couples, children and individuals. The new Westlake Village location will provide additional classrooms to accommodate the university’s growth and an accessible location just off Highway 101 to benefit startup businesses and counseling clients. It will be located at 31416 Agoura Dr. #110 in the new LC3: Lindero Canyon Creative Campus. CLU also offers classes at centers in Woodland Hills, Oxnard and Santa Maria and at its Pacific Lutheran Theological Seminary campus in Berkeley.